Netflix shares are falling deeper into a correction. Netflix took a hit in March after the Facebook data breach. It took another hit after a Trump tweet threatening to crack down on Chinese investment into US tech. Netflix shares plunged deeper into a correction Monday, down as much as 4% in the morning, to an intraday low of $US283. The tech-heavy Nasdaq was seesawing Monday morning, currently down 1.8%. Netflix hit an all time high of $US331 on March 9, and has since fallen more than 10% from that mark, as several events have given investors pause. A massive data breach of Facebook user accounts roiled markets on March 19. 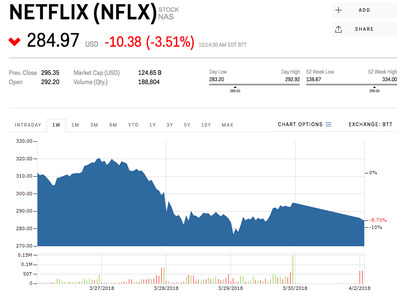 Netflix fell during that week, and then was hit hard again after Trump said that he would crack down on Chinese investment into tech companies, sparking fear among investors that such a move could hurt Netflix. Netflix is up 41% year-to-date.